By Kori ~ March 26th, 2014. March is Taste Washington Wine Month, the annual celebration of Washington State’s award-winning wine industry featuring promotions by restaurants, retailers, hotels, and wineries throughout the region including activities such as free tastings, discounts on Washington wine, and winemaker dinners pairing the state’s top winemakers and chefs. If you live in Washington and haven’t yet taken advantage of the special promotions going on this month, you have just a few days left to do so. Once again, the highlight of the month is sure to be Taste Washington, the nation’s largest single-region wine and food event, taking place this weekend on Saturday, March 29th and Sunday, March 30th at CenturyLink Field Event Center in Seattle. Hosted by Seattle’s Convention and Visitors Bureau in partnership with the Washington State Wine Commission, Taste Washington is the ultimate carnival for wine and food lovers. Of the 780+ wineries in the state, 226 of them will be on hand pouring their wines. The popular Taste the Vineyards section is back and will feature growers pouring wines made from their grapes. In addition, 68 Northwest restaurants will be serving small bites. Whether you attend the Grand Tasting on one or both days, which lasts three hours each day for General Admission and four hours each day for VIP ticketholders, it is impossible to visit every booth and taste every wine being poured and every bite being served. It is a huge event and can be overwhelming if you are not prepared. You will be wise to plan a strategy ahead of time. 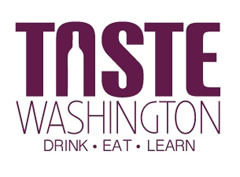 First, I suggest that you visit the Taste Washington website to download the event program so you can plan your route in advance. Make a list of the wineries that you’d like to visit, and then prioritize that list. Start with the ten you don’t want to miss, then mark the next ten you’d like to visit if you have time and so on. It really gets crowded during the general admission hours, so you might not get to as many wineries as you’d like. But if you visit only ten winery booths and try all three wines they are serving, that’s thirty wines right off the bat. Then depending on time, crowds, etc., you can try more if you’d like. Once you have determined which wineries you’d like to try and you are actually at the event, there are several things to keep in mind to make sure you make the most of the event while tasting responsibly. These tips are important to remember for wine tasting newbies and veterans alike. Spit! This is extremely important. We always spit when we attend large tasting events like this or are visiting wineries. Otherwise, you end up drinking too much which won’t feel good the next morning and you won’t be able to really tell which wines you like and don’t like after the first few you taste. Drink water. Alcoholic drinks dehydrate your body so it is important to drink a lot of water to help your body rehydrate. Eat. Be sure to eat a good meal before the event begins so that you are starting with a full stomach. Then, once inside, stop at the restaurant booths to keep your stomach full. Try to eat something at least between every fifteen to twenty wines you taste. Don’t be shy. Tell the wineries what you want to know, what you like, and what you want to try. If they have a better idea of your interests and level of wine knowledge, they can help point you in the right direction and make your Taste Washington experience even better. With that said, though, please be respectful of all of the wineries and other vendors who are there to serve you. Make safe transportation arrangements. After you’ve enjoyed this fabulous event, we want to make sure you get home safely. And last, but certainly not least, have fun! If a smaller, more intimate gathering is more your speed or you want to further your knowledge of wine and Washington wine in particular, the seminars that will be offered each day prior to the tasting might be of interest to you. This year’s seminars will also be held at CenturyLink Field Event Center. Eight seminars will be offered on a variety of topics and afford attendees the opportunity to taste, discuss, meet, and learn from some of the biggest names in the Washington wine industry as well as a few notable guests from outside of Washington State. As always, we are looking forward to Taste Washington and hope that those of you who live in the greater Seattle area will plan to attend as well. For more information or to purchase tickets, visit the Taste Washington website. Nice list of tips! We love the seminars, and are especially excited for Jamie Peha’s Food & Wine Pairing talk with some local top chefs. We will have a booth at the event and would love for fellow wine enthusiasts to stop by, taste some wine, possibly meet a local wine maker and more! Thanks, WWC! We’ll see you there. Cheers!